They work by "drawing" images onto the retina, and will help those with vision impairments to enjoy those activities most take for granted. According to statistics from the World Health Organization (WHO) there are an estimated 285 million people suffering from visual impairment worldwide, 246 million of which have low vision, or moderate to severe visual impairment. If you’re one of these people, don’t fret. It’s science fiction to the rescue. At the 1st Medical IT Solutions Expo of Medical Japan, Japanese researchers from QD Laser, in collaboration with the Nano Quantum Information Electronics Department of the University of Tokyo, has developed a pair of glasses that help those with low vision see. Equipped with a tiny camera and a mini-laser, the “Laser Eyewear” (LEW) is able to capture and project images directly to the wearer’s retina, allowing weak-sighted people go about their daily activities such as watching TV, browsing online, or reading a book. How Does it Help People With Low Vision See? To better understand how the Laser Eyewear (LEW) works, it’s important to first understand how the retina works. Simply put, when light enters our eyes, the retina converts it into signals. These are then delivered through the optic nerve to the brain, which then interprets them into the images that we see. So, when there’s damage to the retina, the brain doesn’t receive the signals properly, resulting in a variety of vision impairments that range from partial to complete vision loss. Unlike other wearables which use small LCD screens, these retinal imaging glasses can directly draw the images onto the person’s retina with its mini-laser. Located inside the frame of the glasses, the laser provides the wearer with the digital information of an image using the retina as a screen. 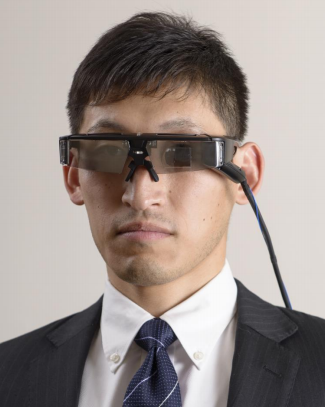 “By using these glasses, people with low vision will be able to read books, newspapers, bulletin boards, timetables and walk around outside,” said Mitsuru Sugawara, CEO of QD Laser. Imaging digital information of characters and pictures from digital devices like personal computers. A camera module equipped in the center of the glasses frame. Providing left, right and binocular vision by both-side optics. Adjusting the laser light intensity. Multi-step fitting for each individual. Shading with a cover on the frame. QD Laser is in the process of streamlining the design of their prototype, removing the bulk so that it looks like a typical pair of eyeglasses once finished. It’s also further optimizing the shape of optics, reducing the energy consumption, and developing wireless technologies that will support the LEW for its planned launch by the end of 2017.